Recently I discovered a great website called 100 Days of Real Food. I love it because the recipes use simple, unprocessed ingredients and they’re not overly complicated. Perfect for my “lazy cooking from scratch” style! I started with the short list of ingredients, all things I keep on hand. Love it! 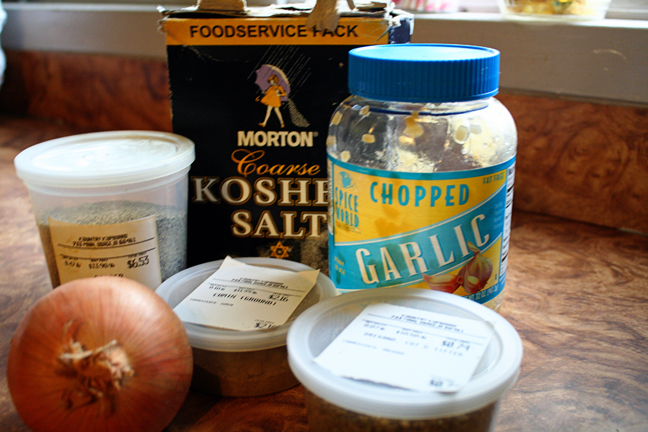 You can use any kind of salt, I just happened to grab a box of kosher salt. 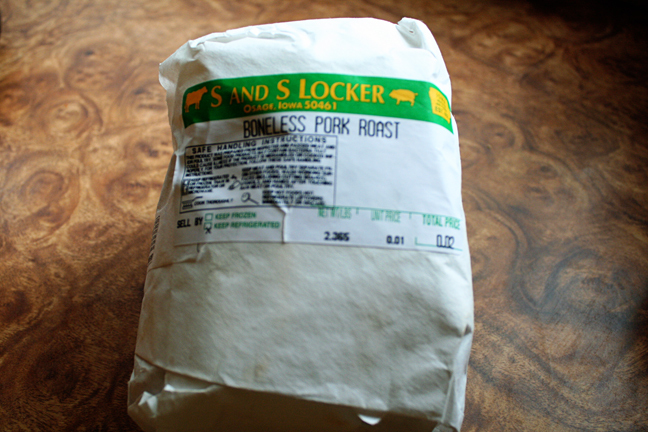 And a package of our own boneless pork shoulder roast. Since our meat is frozen, I used our microwave’s auto-defrost setting. The roast was still somewhat frozen in the middle, but thawed out enough to cut into chunks as the recipe instructed. I rubbed the seasoning mixture on each piece, and when I was done sprinkled the leftover seasoning over the meat. No need to add any liquid. I chopped up my onion and used minced garlic. Then, instead of taking them out at the end as she did, I mixed them right into the meat. They’re cooked down so soft even my picky eater didn’t notice them. I cooked the meat in my slow cooker on medium and it was ready to shred after 5 hours. Your mileage may vary, depending on your slow cooker. It seems like the newer ones cook hotter and faster than the older ones. I always keep a close eye on new recipes, and make a note on the cooking time & heat setting for next time. 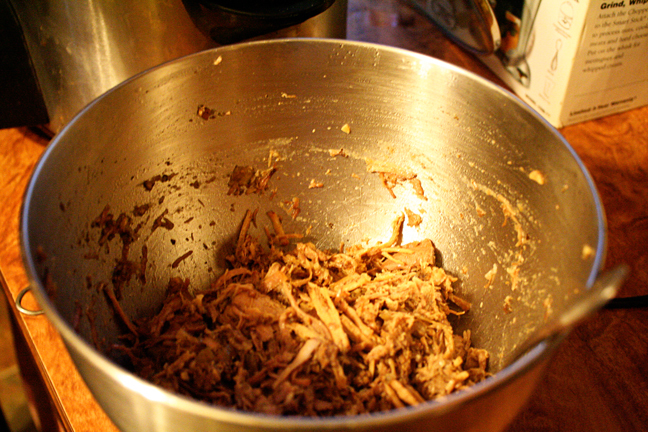 Here’s a trick I wish I’d discovered years ago… using my stand mixer to shred meat! Just be sure your meat is boneless. But it works with pork, beef, or chicken. Just throw the cooked meat in the mixing bowl, use your regular mixing paddle attachment, and you’ll have lovely shredded meat in a minute or less! 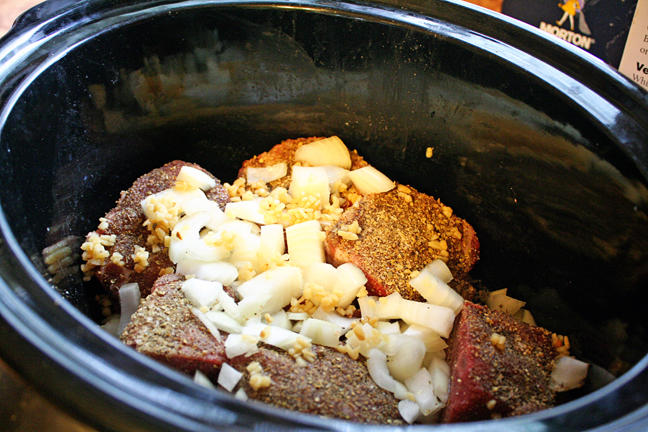 Mix the shredded pork back into the juices left in the crockpot and you’re ready to eat! So easy! 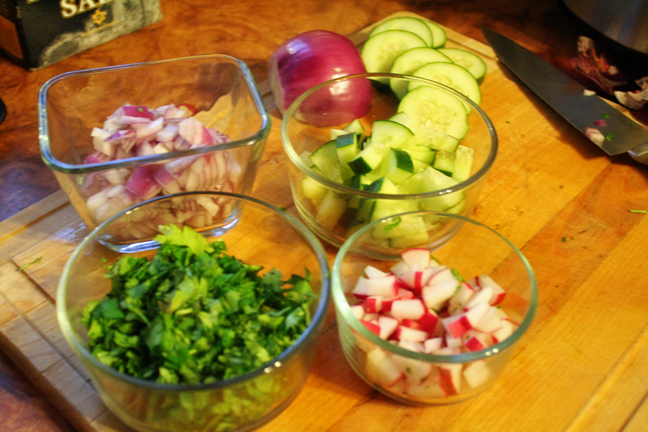 Here’s something I learned this summer when I bought a taco from the taco truck at the county fair: radishes and cucumbers make delicious taco toppings! 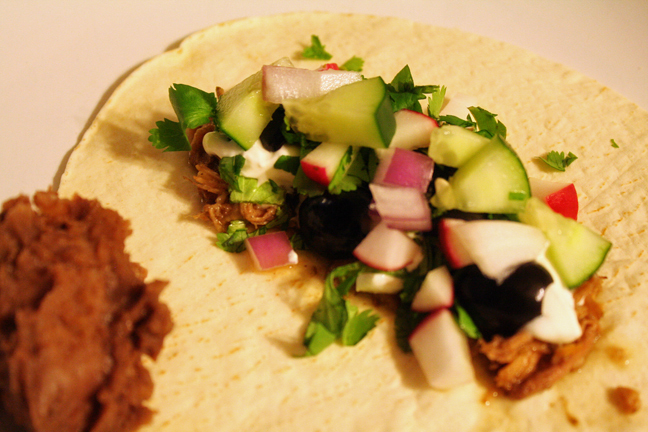 I also had some fresh chopped cilantro and diced red onion, plus the usual taco topping suspects – sour cream, shredded cheese and black olives. We used flour tortillas, but corn tortillas would be tasty, too, and my favorite refried beans – organic refried black beans. The only thing I would add next time is some lime slices for drizzling a little lime juice over everything. We’ll be butchering pork the first week of November, so let us know if you’d like to reserve some of these boneless pork shoulder roasts!